This is the Neopets' version of Tetris, only more complex and fun to play! The goal is very simple: keep the falling fruits from reaching the top. The game screen and controls are very straightforward. Use the right and left arrow keys to move the cluster of falling fruits left or right. Pressing down will make the fruits fall faster and the spacebar is used to rotate the fruits in the cluster counter-clockwise. There are five types of regular fruits. The three that you begin with are the Plumberry (purple), the Blobbule (blue) and the Stramberry (orange). The Guish Melon is introduced on the 4th level and the Lemwart is introduced on the 7th. To remove fruits, you need to use bombs. Each fruit has a corresponding bomb which is used to remove that fruit. Bombs blow up fruits of the same type that are either touching the bomb or touching a fruit that is about to be removed. There are two special items in this game. The one resembling a potion turns all fruits of the kind it lands on into another type. Unfortunately, it may turn those fruits into the type that is next to be introduced. For example, on the first level, the potion may turn fruits into Guish Melon which cannot be removed without special items until the fourth level. The second item is the green fruit bomb. This bomb removes all fruits of the kind it lands on. It can easily clear a large portion of your screen so use it wisely. For both of these items, if they are placed at the bottom of the screen, they will react with the fruit to their left rather than their right. 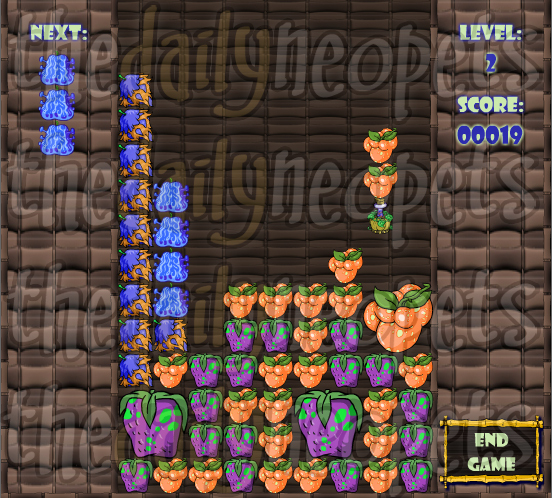 As you progress through the levels, the clusters of fruits will drop faster, making the game more difficult. Additionally, every while several fruits will be randomly dropped on your screen. The further you are in the game, the more frequently and the greater the amount of fruits will be dropped. You will move on to the second level on placing your 18th cluster of fruits. After that, you will advance a level after every 20 clusters. Group the same fruits together as much as possible and create the largest fruits you can. The point bonuses you get from larger fruits allow you to have a higher score at a lower level, which means more points in the end. Try to keep all the same types of fruits connected. You want to clear as much as possible with each bomb. If you have any isolated groups of fruit at the bottom where normal bombs can't reach, use one of the special items to remove them. Do the same if you have many scattered small fruits of one kind. You want to keep your screen nice and organized. The odd out of place fruits add up after a while if you don't clean them out. Avoid having too many fruits in the middle. If the pile becomes too high you won't be able to get the fruit clusters from one side to the other, which would mean less space to work with. If it really gets too high, game over! You can try to stockpile the fruits at the side, clearing them with a bomb from time to time. If you are still having trouble getting those 1000 points for the avatar, or need a higher score for that trophy, this is a good strategy to give your points a boost. Try to have a screen like the one shown below. Pile fruits of two types, no more, in a 6x6 area, leaving the third type to the side. Then, wait for a potion to come by and use it on one of the two types of fruit, as shown in the screenie. In this case, if all the orange fruits turn purple, there will be one large, 6x6 purple fruit, worth 216 points. There is a one in three chance of this working. If it doesn't, wait for another potion and try again. This can also be done with a 7x7 area, or larger for even more points, although I don't recommend more than 7x7 unless you are really determined. That's about everything you need know on Gadgadsgame! It's a fairly easy game, and quite fun to play. As long as you maintain a good screen and bunch those fruits together, you should be scoring high very quickly. Good luck!